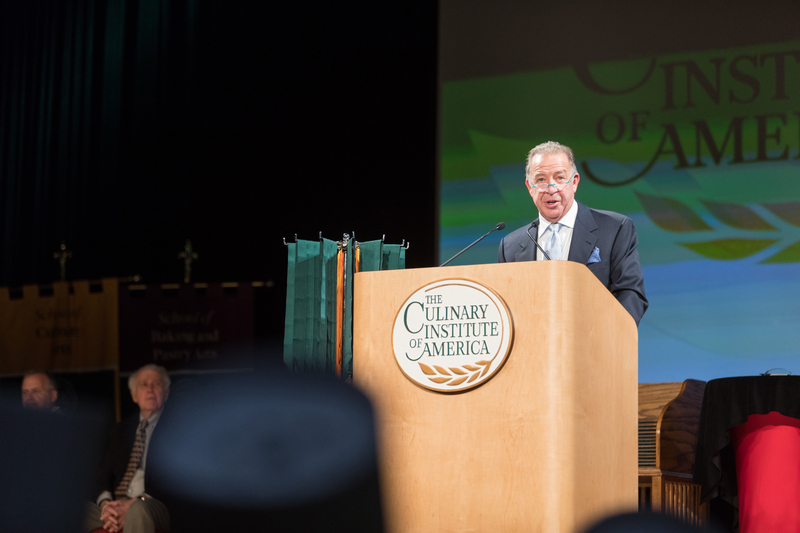 Hyde Park, NY – Joe Gurrera, best known for his Citarella epicurean markets, spoke to associate degree graduates of The Culinary Institute of America during commencement ceremonies at the college’s New York campus on December 20. At the forefront of New York City’s gourmet food revolution for decades, Mr. Gurrera also owns Lockwood & Winant at the Fulton Fish Market and hospitality seafood purveyor Meat Without Feet. Continuing as a trailblazer and innovator in the gourmet hospitality scene, he is growing his online seafood store and recently opened his first wine shop, Citarella Wines & Spirits. Mr. Gurrera gives back to the community in his native New York, as an active supporter of organizations like Citymeals on Wheels, City Harvest, The American Cancer Society, and Long Island Hospice Care Network. In addition to being a member of the CIA’s Society of Fellows, Mr. Gurrera is a member of the board of the New Fulton Fish Market Cooperative. The entire CIA graduation ceremony, including Mr. Gurrera’s keynote address, can be seen online.